A Budget friendly Business Hotel that aims to provide quality services which exceeds the expectations of the guests and make them feel at home away from home. BHPL (Baramati Hotels Pvt. Ltd ), An idea conceived by Gujar which stands supported by a dynamic and experienced team with a common goal and vision. Gujar Family being one of the most reputed business families of Baramati , have been involved in to various social initiatives and strongly believe in ethical business policies. Our vision is about understanding the guests needs, and to provide enjoyable and unique solutions to that, without compromising on the quality of product and services and offering value for money at the same time. Our ideas of innovation are based on understanding real life needs and creating unique ideas to satisfy. 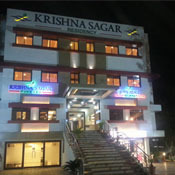 Innovation has been a very strong KRISHNA SAGAR RESIDENCY trademark in all its endeavours. Mouth Melting Taste is our Speciality. The menu is a blend of classic, contemporary and traces of Indian cuisine, making the food just as exciting to the palate as it is to the eyes. Krishnasagar Residency, Opposite SBI, Bhigwan Road, Baramati - 413102. (MS) India.